Roger Federer was recently part of the Laver Cup in Chicago. Roger Federer is likely to be eligible to play at the Tokyo Olympics in 2020 even if he does not compete for Switzerland in the revamped Davis Cup next year. The 37-year-old’s lucrative clothing deal with Japanese firm Uniqlo was seen as another indication he was hoping to play on until what would be a fifth Olympics, with a singles gold medal the one major title still to elude him. But, according to the rules, in order to qualify for Tokyo players need to have taken part in at least two Davis Cup or Fed Cup ties during the current Olympic cycle, including one in 2019 or 2020. Federer has not played in the competition since 2015 and Switzerland missed out on a wild card for the inaugural finals week of the revamped Davis Cup next November, with Britain and Argentina picked instead. Switzerland instead must face Russia in the qualifiers in February immediately after the Australian Open, where an appearance by Federer would be a major surprise. But International Tennis Federation president David Haggerty revealed there is wriggle room, saying: “Within the rules are things about past champions, past Olympians and grand slam winners. 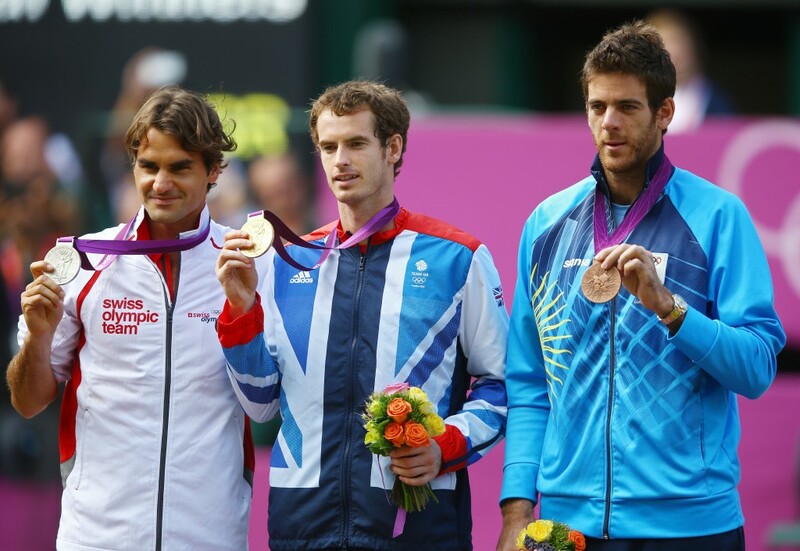 Roger Federer was a singles silver medallist at the London 2012 Olympics. Haggerty confirmed on Tuesday that next year’s Davis Cup finals week will be held in November at the very end of the season, which could make attracting the best players very difficult. World number five Alexander Zverev has already said he will not play if Germany qualify. Gerard Pique, the man behind the Kosmos investment group that initiated the radical changes to the competition, had expressed a desire to hold it in September, which would have brought it into conflict with Federer’s Laver Cup. Barcelona footballer Pique earned a sharp rebuke from Federer, and Haggerty insisted any further move to shift the Davis Cup to a more appealing spot in the congested calendar will come through negotiation. Relations between tennis’ governing bodies, in particular the ITF and ATP, have been highly fractious of late but Haggerty is optimistic collaboration is possible. He said: “The end of the season is a bit of a challenge so looking at the schedule in its entirety is good. This is the first time in quite a few years that I can remember of the stakeholders getting together to have some serious conversations. Kosmos have promised to invest an eye-watering $3billion US dollars into tennis over 25 years, and the solidity of that commitment was one of the key question marks at a heated ITF AGM in August, where the Davis Cup proposals were eventually voted through. Haggerty insisted the contracts are all secure, saying $18million (approximately £13.7million) is already in the bank. The Davis Cup changes leave two free weeks in the calendar next year, and the Daily Telegraph revealed last week that one of those could be filled by the Majesty Cup, a winner-takes-all competition. Haggerty revealed the tentative plans involve a small draw of 16 or 32 players and a shortened format, with the event played over two days following the US Open. The neglected Fed Cup, meanwhile, is set to be revamped in 2020. Roger Federer has fired a warning shot to Gerard Pique after it was revealed the Barcelona footballer wants to hold the revamped Davis Cup in September. Pique is behind the Kosmos investment group that has partnered with the International Tennis Federation to make radical change to the historic competition, the centrepiece of which will now be a World Cup-style week-long event beginning next year. Having initially said it would be held in November in the same week the Davis Cup final is currently played, Pique told Le Figaro last weekend that he is now working to change it to September after discussions with several leading players. That would see it become a direct rival to the Laver Cup, the Ryder Cup-style competition devised by Federer and his agent Tony Godsick, with Geneva due to host the third edition from September 20-22 next year. 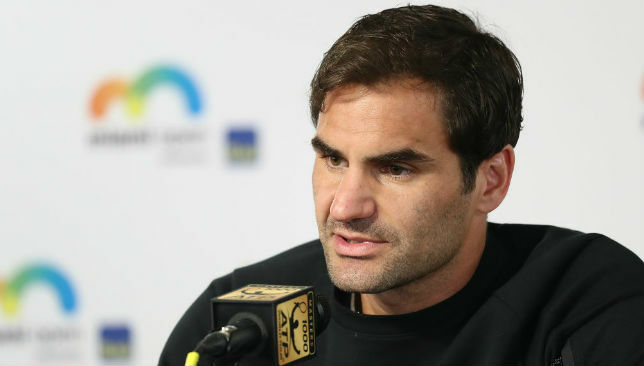 Speaking to French-speaking reporters following his first-round win over Yoshihito Nishioka at the US Open on Tuesday, Federer said: “I’m in favour of innovation, and not everything is negative with the new Davis Cup. Roger Federer is preparing for his 18th main draw appearance at Flushing Meadows. Roger Federer is gearing up for his 18th main draw appearance at the US Open this coming week. The 37-year-old won the last of his record five consecutive Open Era titles in New York in 2008 and despite his recent disappointing exit at the quarter-final hurdle of Wimbledon and a below-par final performance against Novak Djokovic in Cincinnati, the Swiss is still among the frontrunners to rule in the Big Apple after a season in which he won his 20th Grand Slam at the Australian Open and became the oldest World No1 in history. 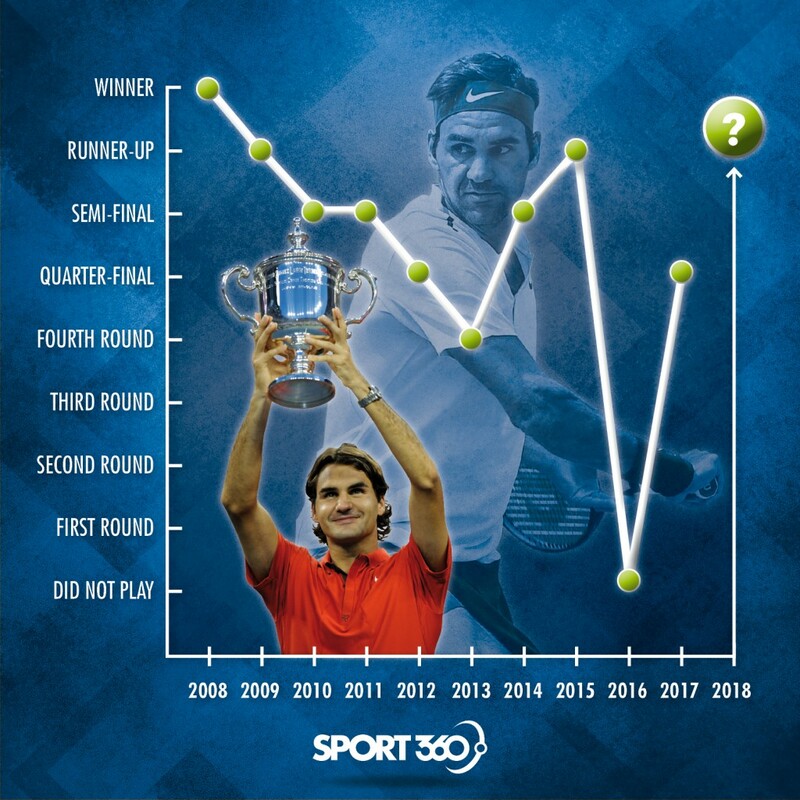 With the fourth and last major of 2018 set to get under way on Monday in the city which never sleeps, here we pinpoint notable elements of Federer’s mental, physical and tactical evolution as a player during a storied career which has spanned more than two decades. Racquet-smashing and temper tantrums often overshadowed Federer’s obvious talent rising up through the junior ranks in the 1990s. So much so there was a real danger his potential would go unfulfilled as a result. Peter Carter, his then coach and also close friend, can be credited to a large degree for keeping Federer on track as much as possible in his formative years. Tragically, however, Federer’s early mentor was killed in a car crash in South Africa in 2002. In the midst of grief, somehow, the up-and-coming star seemed to gain a clearer perspective that tennis wasn’t everything anymore, but at the same time, knew he dare not waste the immense opportunity and privilege his parents Robert and Lynette, Carter and others had given up everything for in order for Federer to succeed. It was the reset button Federer needed and since then, we have barely heard an on-court utterance from the smoothest of characters and a man who is admired and respected the world over – winning the ATP World Tour Sportsmanship Award for the past 15 years in the process. Less than a year after Carter’s death, Federer beat Mark Philippoussis to win his first Wimbledon title and major at the age of 21. 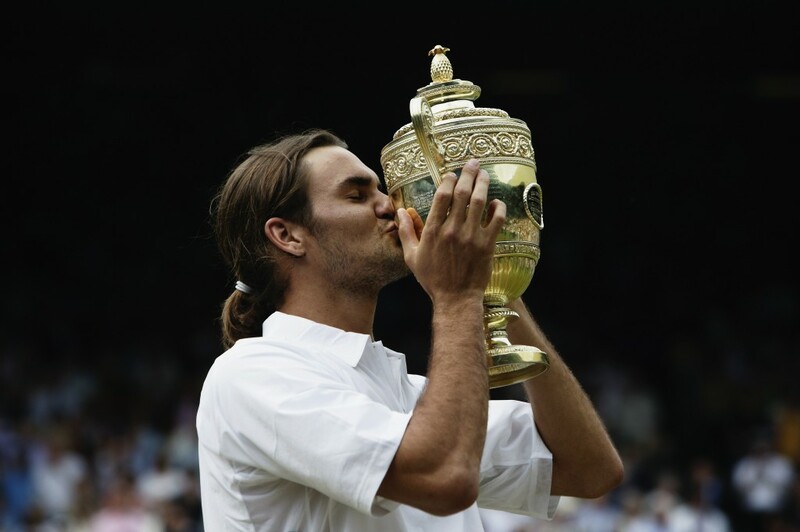 Breakthrough: Federer with the Wimbledon title in 2003. The rest, as they say, is history. It is that weight of history though that Federer will never forget. Top sportspeople often have dedicated teams working with them and Federer is no different. That said, Federer was acknowledged as the first tennis player to appoint a dedicated physiotherapist to travel with him everywhere and that has been a key factor in his longevity. At the moment, he works with Swiss specialist Daniel Troxler while previously he spent time with Stephane Vivier – who more recently has been part of Grigor Dimitrov’s team – for a five-year period from 2009 to 2014. Troxler was particularly important in helping to rebuild Federer’s core strength, leg power and flexibility following his 2016 lay-off. But no-one has made more of an impact on Federer’s fitness than Pierre Paganini, the veteran physical trainer who has been side by side with Federer for over two decades. His style is different and a large part of his focus has been to ensure Federer is in optimum condition when it comes to on-court balance, coordination, agility and quick-step footwork – an area of his game which has been fundamental to his movement. The two also work on recognition skills, whereby Federer might run to the backhand wing without a racquet and sprint drive to the net as if he was retrieving a drop shot. This obsession with cognitive stimulation, underpinned by stringent fitness drills, gave Federer a crucial edge for many years before other players started to take notice of how he was managing himself with laser-like precision, staying injury-free in the process. Along with natural talent, fitness and the Grand Slam-winning prowess which saw Federer claim his 15th major at Wimbledon at the age of 27 in 2009, Federer and his team, wife Mirka, two sets of twins and comprehensive entourage, including long-term coach Severin Luthi, have been on-point when it comes to planning, preparation and gearing everything towards success on the court. For example, skipping the French Open for the last three years to save energy and evaluate the bigger picture moving forward was a shrewd move. Likewise, he has always been ready to step in and prosper when opportunity knocks, with his 2009 triumph at Roland Garros being the biggest proof of that. Overall, this balancing act has and continues to play a big role in his career. The highs – and there have been plenty of them – as well as the lows were all just part of the ride as rivalries with the likes of Rafael Nadal began to become more and more intense. 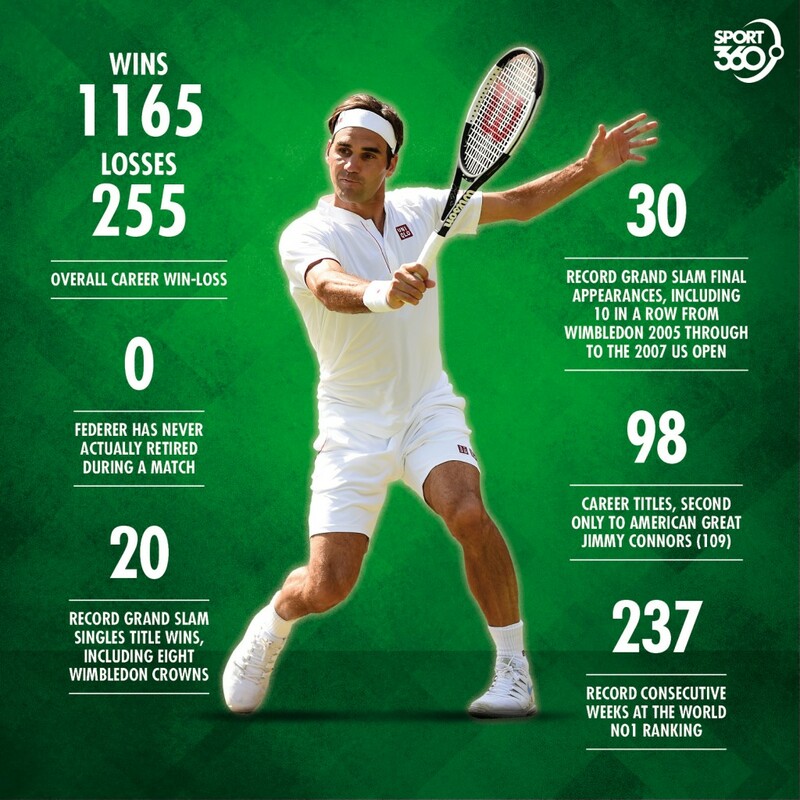 At the age of 31 going on 32, there were noticeable cracks in the once unbreakable Federer armour. Several back issues were the undercurrent to a poor campaign which saw him slip down the rankings to No7 in the world – his lowest ranking in 11 years – and he also failed to reach a major final for the first time since 2002. His second round defeat to Sergiy Stakhovsky at Wimbledon, in which he was defending champion, made many question where he was headed. Federer moved on from coach Paul Annacone at the back end of the year and something had to give moving forward. 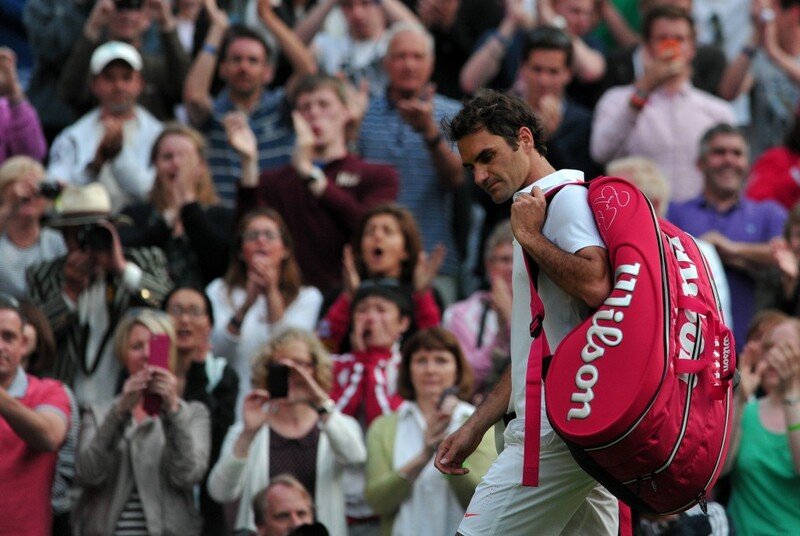 A dejected Roger Federer was beaten early at Wimbledon in 2013. Following that difficult season, Federer opted to change to a bigger racquet head at the start of 2014. Upgrading to a 97 square-inch frame wasn’t revolutionary – many players had done it before Federer – however the Swiss, reluctant to tweak a formula which had brought him 17 slams up until that point, needed some convincing. Nevertheless, he had to follow the wave of technology improvements having seen and played against journeymen tour players who were now hitting the ball harder than him. It was a wise transition as it gave Federer slightly more margin for error to make contact with the sweet spot of the racquet, which is a crucial play when it comes down to the big points in big matches. 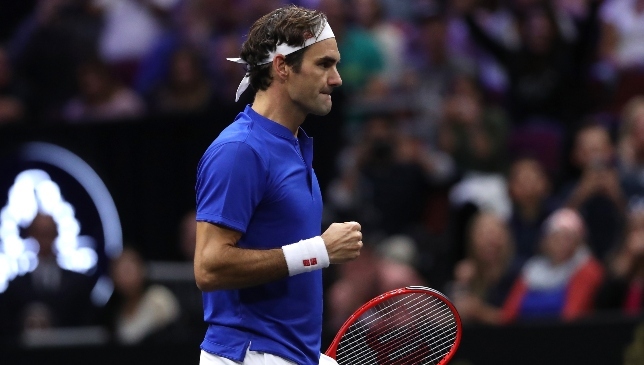 Federer’s game had always been attacking and while he enjoyed coming to the net and had comfortably been one of the best volleyers on tour for a decade, we were always more accustomed to seeing the Swiss operate from the baseline with his dictating forehand and accurate backhand slice. However, that changed when he appointed his boyhood hero, Stefan Edberg – the winner of six slam titles – as his coach. As a result, Federer played with more freedom and assault than ever before under the Swede’s tutelage during a two-year spell. One of those tactics Edberg helped Federer introduce was the SABR – Sneak Attack by Roger. This ploy saw Federer move several feet inside the baseline to meet the opponents’ serve virtually on the half-volley on the service box line, therefore, putting immediate pressure back on the server with a quickfire return. Most players would struggle to implement such a strategy but it was a fascinating ingredient during Federer’s run through to the 2015 US Open showpiece – one of three major finals he reached under Edberg (losing all three to an imperious Djokovic) – enabling Federer to save vital energy, shorten the points and spend less time in lungbusting rallies on the baseline. This plan, along with those other attacking instincts, added years to Federer’s game in the long run. The former World No3 had a tough ask to follow Edberg but his appointment towards the end of 2015 proved to be a masterstroke. The two had always got on, faced each other 16 times on the ATP World Tour (Federer winning 13 of those matches) and there is no doubt Federer liked that the 6ft 4in Croatian, who had only recently retired from the game in 2012, found time to coach Milos Raonic in that intervening period. Tennis is in Ljubicic’s blood, but he wasn’t brought into Federer’s inner-sanctum to tell him how to win majors again after a four-year drought. After all, the now 39-year-old coach only reached one major semi-final in his whole career. A secondary voice was needed again to compliment Luthi but Ljubicic was cleverly added to bolster Federer’s backhand wing. The Swiss’ one-hander had always been a much talked about Achilles heel throughout his career and while it was a better weapon than most, against Nadal (and Djokovic to an extent) the imbalance going to his left was brutally exposed by the Spaniard’s top-spin – particularly during four French Open final losses to Nadal. Fortunately, Ljubicic – who had a high-class one-hander himself – had plenty of time to work on that side and show age is no barrier to learning new tricks. It was a stop-start beginning to Ljubicic’s tenure though as Federer underwent surgery in February of 2016 after sustaining a meniscus tear in his knee while slipping in the bathroom. He did return, perhaps too swiftly, but then called time on his season after a crushing five-set semi-final defeat at SW19, ironically to Raonic. The headline writers were out in force writing the Federer obituary. 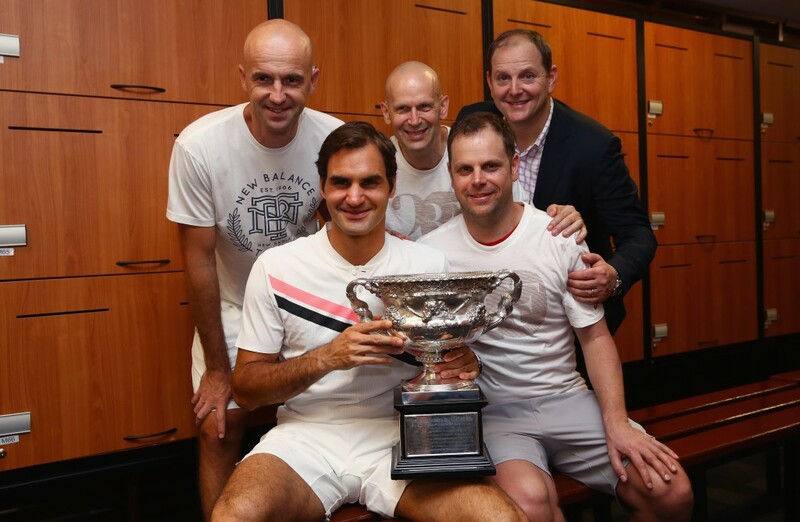 Back row L-R: Ivan Ljubicic, Daniel Troxler and Tony Godsick; Severin Luthi (front). After a thorough period of rehabilitation and rest – the first time Federer had been away from the court for that long since he turned professional in 1998 – the veteran began hitting again during the final months of the year. Federer trained hard to get in the best physical shape and it paid dividends, although he returned in early 2017 with lower expectations. In truth, no-one knew what to expect. But what followed was a legacy-defining Grand Slam triumph over Nadal in the 2017 Australian Open final, where Federer’s backhand was noticeably more powerful, driven, direct and punishing. Ljubicic’s impact was stark, Federer stepped into the court more and more, going for far greater conviction (for broke almost) on his backhand wing, hitting it flat and true, rather than slicing. That was a key component to his victory in Melbourne and his surge post-35 back to the top of the game. It is also no fluke Federer has won his last four meetings against his greatest rival under Ljubicic’s guidance. Is there a natural crescendo to Federer’s storied career? It’s hard for anyone to predict. 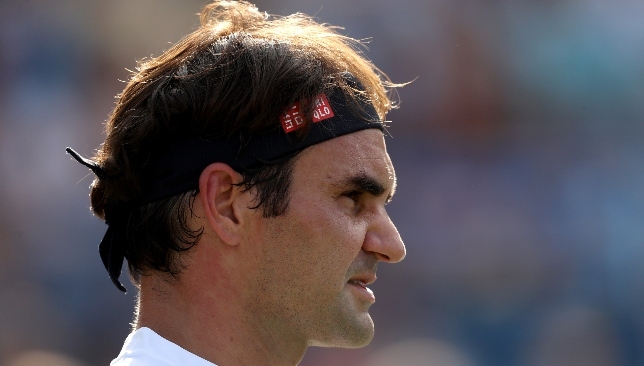 Federer will at least want one more crack at winning Olympic Games singles gold in Tokyo in 2020 and while he is feeling good and near the top of the game competing, it is not out of the question he can continue playing on until the age of 40 with clever scheduling.